For the first three years, social studies and science work are deeply intertwined in the classrooms, as children are immersed in experiences that help them better understand their communities and environments. While certain studies may fall neatly into the categories of science or social studies, at this age the connections among them are very strong, with most explorations highly integrated in nature. 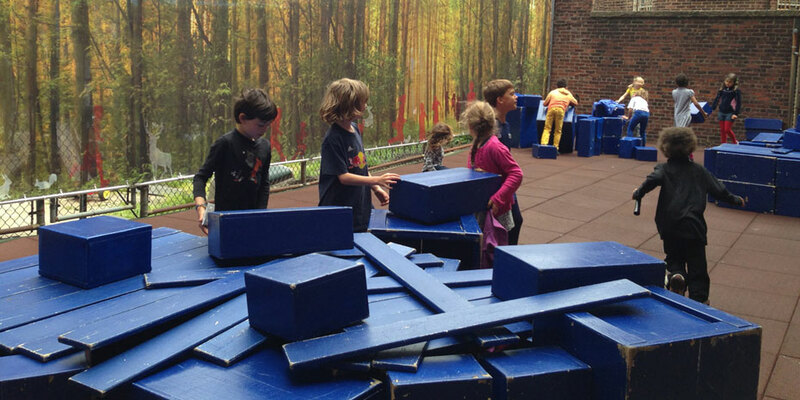 We call these core studies “Community Work.” Whole-class block building is an important arena for learning: children build realistic scaled models based on first-hand research, and then use their structures to deepen their experience through dramatic play and reenactment. Each year, Greene Hill selects thematic units that are both age appropriate and exciting for students, based on both teacher and student interests. There are some general themes and specific concepts that are addressed every year, ensuring that students experience a rich, comprehensive curriculum over the course of their time at Greene Hill School. For each major unit of study, specific inquiry skills and areas of content knowledge are outlined and used as benchmarks to assess children’s learning. Beginning in the 7s, students at Greene Hill work in the Science Lab twice a week. Their classroom teachers collaborate in this work and facilitate interdisciplinary connections. Investigations are hands-on and exploratory, providing students with a solid foundation in content knowledge across the key fields of earth, life, and physical sciences. Students also acquire a strong facility with scientific process skills, learning how to conduct authentic research to make discoveries. Teachers articulate specific benchmarks for each unit of study to evaluate students’ understanding of content knowledge and use of inquiry skills. Lower School science education harnesses children’s curiosity about the natural world, building their base of knowledge through discovery and experimentation as well as through research. Scientific skills like analyzing data and constructing inferences and explanations based on evidence are emphasized. Science instruction happens in the classroom in the 4s-6s, with classroom teachers and push-ins from a science teacher. Beginning in the 7s, science becomes a separate class occurring regularly. Science in the 7s explores interdependent relationships in different ecosystems, the structure and properties of matter, and some of the many processes that shape the Earth. They are introduced to the steps of the scientific method and begin to apply them to investigations of plant diversity, forces and motion, and earth materials. They develop skill in planning and conducting investigations, observing, describing, and classifying objects and phenomena, constructing evidence-based explanations, and analyzing data. Major themes explored in the 8s are life cycles and traits of living things, forces and motion, and weather patterns and phenomena. Students continue to practice applying the scientific method to pose and answer questions and satisfy their curiosity. Their hands-on explorations take place alongside book research as stu- dents formalize their knowledge of physical phenomena. They learn how to use evidence to construct explanations, determine cause and effect relationships, and represent and interpret data. In the 9s, students explore the function and survival of living things, the transfer of energy, the use of renewable and nonrenewable energy, and the interactions between the geosphere, atmosphere, hydrosphere, and biosphere. They learn about the work of research scientists and review current scientific research. They collect and organ- ize data, making choices about the most appropriate way to represent their findings and looking for apparent patterns or relationships in data. 10s continue to explore the movement of energy through ecosystems; their work with the interactions of the Earth’s systems extends to include patterns observed in space. Students also focus on renewable resources and conservation efforts. An emphasis on stewardship and conservation is appropriate for this age group as children deepen their understanding of the interconnectedness of living things and the role of humankind. Students take more ownership over the scientific inquiry process, pursuing topics and questions and constructing experiments more independently. Describe and compare physical properties. Describe the basic life functions and life cycles of plants and animals. Develop reasonable hypotheses, and evaluate those hypotheses in light of data collected. Employ tools to gather, analyze, and interpret data. Formulate and communicate explanations using evidence. Identify dependent and independent variables. What are ways that energy can be transformed? What roles do plants and animals play in their environments? What are the properties of electricity and magnetism? How are plants and animals in an ecosystem interconnected? What are the processes that shape landforms and bodies of water on Earth? How can we formulate questions of scientific inquiry and construct scientific investigations to explore those questions?